Havana and Washington are going to restore the diplomatic relations and embark on a long dialogue. One of these days there was a solemn opening of the embassy of socialist Cubain the capital of the United States. The minister for foreign affairs of the Island of Freedom, Bruno Rodriguez, made a speech at the ceremony of raising of Cuban flag beside the diplomatic mission building. He was accompanied by other official persons. 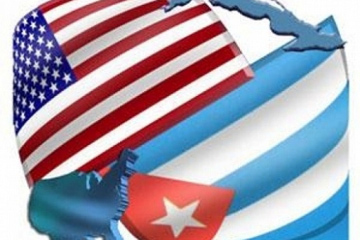 According to the Cuban minister a complete normalization of the relations between Cuba and the USA would be possible provided cancelling the blockade and restitution of the base Guantanamo to his country. Then he had negotiations with the Secretary of State of the US, John Kerry. The chief of the State Department informed that he was going to visit Havana on the 14 of August to part in the ceremony of raising of American flag in front of the US embassy in Cuba. And John Kerry wrote in Tweeter that “it would be an honor for him to raise the American flag in Havana for the first time in 56 years”. (There had been rumors about a brief visit of the President Barak Obama to the capital of the Island circulating among journalists, but they still weren’t confirmed). I’d like to note that the diplomatic relations between the two neighboring countries had been broken in 1961, after the victory of the revolution inCuba. And on the 17-th of November of 2014 the Presidents, Barak Obama and Raul Castro declared the intentions of their governments to restore the interstate relations. …This flat seven storied building in the Malecon quay in Havana from a far resembles a giant matchbox. This building erected especially for the US embassy in the height of the Cold War stood empty for some time after the rupture of the relations with revolutionary Cuba. But since 1977 the US diplomats started to work there again – there was located the Department (now they call it ‘section”) of the interests of the USA under the auspices of the embassy of Switzerland. Once I had an opportunity to enter this building and even made a reportage about it. It was nearly a quarter of century ago, in the year of disintegration of the Soviet Union. That time he relations between our countries had got a little “warmer”, and for the first time in the history a soviet journalist was invited into the American seven-storied building standing at Malecon quay in Havana. In the square in front of the enclosed building of the Department of Interests there’s a spacious territory of the “Anti-imperialist court” where Cubans have meetings, cultural events, concerts. And also here there was a palisade of flagpoles with national colors of Cuba or with small black mourning flags raised on some certain days in memory of the passengers of Cuban plane DC-8 blown up on the 6 of October 1976 by terrorists – mercenaries of the CIA. That day the victims of the act of terror were 73 persons. It’s exactly the number of the flagpoles erected in front of the American seven storied building. And a little bit farther there is a tall monument to the national hero of Cuba, Jose Marti holding a child and pointing with his hand the “building-matchbox”. And beside it, nearly by the pediment of the US embassy building, there’s an impressive electrified panel with the words: “Gentlemen imperialists, we have no fear of you!" American “matchbox” with a whole block of nearby low-rise buildings also under the US jurisdiction is tightly circled byHavanapolice. Having left behind the colorful anti-American slogan I stopped by a glass sentry box. A Cuban guard carefully copied the data from my passport and then I entered an American check point in a small annex. Having submitted to “mettle check”, as if it was an airport, I got into the field of view of a well drilled and fully dressed marine on duty. “The order remains order”, David Evans, the first secretary for the press met me smiling behind another “security strip”. By the way, inside the seven-storied building I also noticed several armedUSmarines. All this was an evidence of an extreme tension between Washington and Havana that time which certainly considerably affected the contact of the people of both countries, leaving no hope for normalization of the official relations. I’d like to remember again that this conversation took place in the diplomatic mission of the USA about a quarter of century ago. But, as you can see,Washington needed nearly 56 years to see the futility of economic sanctions and political pressure; of threats and terrorism in relation to neighboring Cuba. … They really expect some VIP visitors from the USA coming to Havan aon the 14 of August for an official opening the American embassy in old building at Malecon. But they’ve just started going on the way in the direction to good-neighborliness. The burden of distrust is excessively heavy. The Cubans won’t be able to forget not a single American invasion of their country, not a single attempt to strangle their revolution. And in Washington they are still counting the losses from the nationalization of American property on the Island nursing the grudge against sharp anti-imperialistic rhetoric ofHavana. But I’d like to note that during this whole period of 56 years the Cuban leaders didn’t reject the possibility of a dialogue with the United States. And besides Havana more than once reminded its northern neighbors that Cuba had never invaded the USA, never occupied any part of the American territory, never decreed a blockade or sanctions against the United States, but only had been trying to improve the life of its people and defend its freedom and dignity. The condition for Cuba could discuss anything with Washington always was the same: the most rigorous respect of its independence and sovereignty. I, as well as many my fellow-journalists and politologists, have no doubts today that the USA government creating a peacemaking climate around Cuba is going to make an active and intensive use of the policy of “mild strength” with regard to the Island, going to promote its interests in the republic, first of all, in the economic and humanitarian fields. In the USA already have been mate some substantial steps in the sphere of interchange of delegations of politicians, businessmen, journalists, writers, artists, scientists, students, athletes. According to news agencies, an American company “Carnival Corporation” is going to carry out cruises to Cuba since 2016 organizing them by the agency of the company “Fathom”, thanks to which Americans will be able to come to theIslandto take part, first of all, in scientific, educational, religious, sporting and cultural events. But Cuba also reserves the right to use its “mild strength” with regard to the USA. And Havana will be doing it quite successfully! As for Russia, in any case we are going to proceed with to increase and extend the comprehensive and mutually beneficial cooperation with the friendly Island of Freedom. Moscow has a great hope, that the first steps of reconciliation in the direction to meet each other will have a positive influence on the future process of normalization of the relations between Cuba and the USA and create a background favorable for removing of the remaining restrictions for Cuba, in the first place concerning a total raising of the trade, economic and financial blockade, will contribute to the development of the regional cooperation in general. And Russia certainly hopes “that Washington will be consistent and make some other steps answering the call of the times and following the constructive vector set in terms of the dialogue between Cuba and the USA”. However the White House is still declaring that the USA has no intentions to return the territory of naval base Guantanamo to Cuba. They say,Washington sees no reason to close the base and plans to maintain it even after the closing of the jail situated there. There’s also no intention to meet the demand ofHavanato pay indemnity for the economic embargo on Cuba put by the USA. And rising itself of the trade, economic and financial blockade of Cuba is still a long way off. In any event while the Republicans have the majority in the US Congress. …In Cuba there is a popular since a long time ago figurative comparison borrowed by Jose Marti from the legend of David and Goliath from the Bible. “We hold David’s sling”, - use to say the Cubans making a hint, that an intelligent and dexterous man managed to defeat the giant Goliath, which, I repeat, on the Island is associated with the large northern neighbor. Naturally the legend stays legend, but the real today’s life is much more complicated. Now there’re also a lot of those, disturbed with the question “Would it be possible for David and Goliath to normalize their relations peacefully”? It’s not the characters from the Book that are spoken about, but the two people divided not only by the Strait of Florida, but by many problems accumulated for more than a hundred years, by the history of political and ideological confrontation itself. The process of normalization of the relations between Cuba and the USA will be complicated, long and arduous. Each part will persist promoting its interests. But as they use to say on the Island of Freedom, “the person, who works, waits and has patience, always will get what he or she wishes”. And there’re little those, who doubt of the persistence and will of the Cubans. 603: 30 seconds to mars. David and Goliath will measure their “mild strength”2 August 2015: David and Goliath will measure their “mild strength”! лучшие комедии. David and Goliath will measure their “mild strength”.